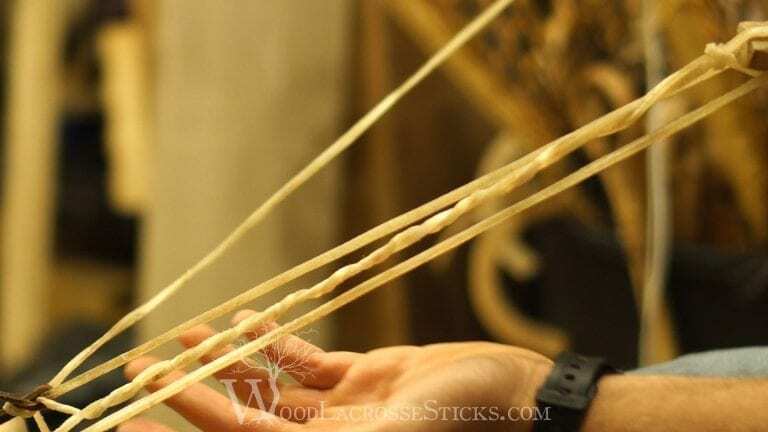 Hey, everyone, I’m very excited to bring to you a tutorial that has been requested of me ever since I started the Wood Lacrosse Sticks project. I’m finally going to show you how to build a gutwall. I’ll be showing you my personal pattern, which I like to call the 3-Column Gutwall. I use this because it fits in all sticks, and I think it’s very strong, narrow, and aesthetically pleasing. 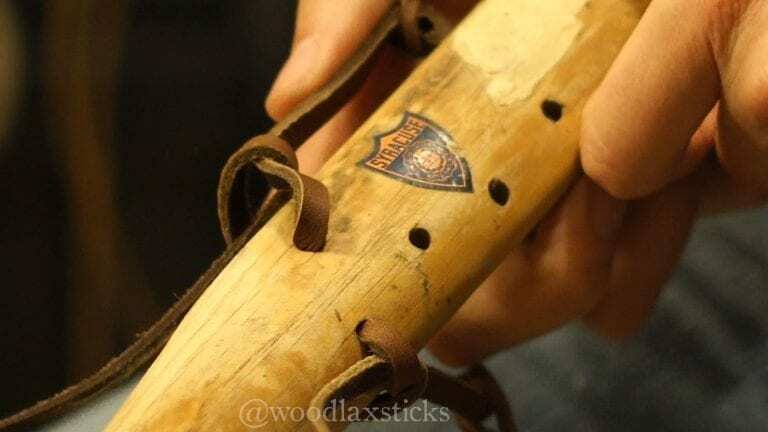 For those that aren’t aware, the gutwall is the webbed side of a traditional lacrosse stick. It gets its name from what it is, an animal’s gut used to make a wall of the head. 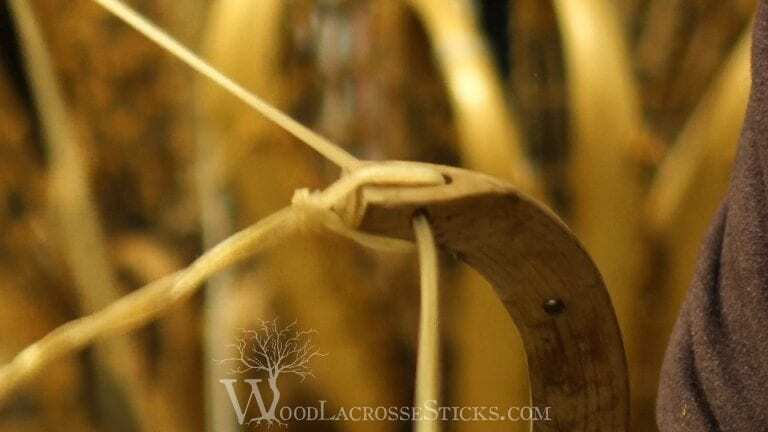 Some modern sticks use nylon and often coat it to replicate the gutwall, but a true wooden lacrosse stick comes from the earth, including a connection to animals. 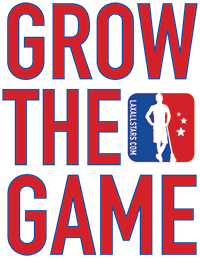 This practice has lasted for centuries through the game’s best stick-makers. First of all, WASH YOUR HANDS. Make sure your hands are as clean as possible before handling the gutwall. The material WILL absorb moisture, making the project slightly tougher. What I like to do is cut around the pocket instead of inside in order to save time and space. Once you clear the frame, it’s time to use your gutwall. I typically have it soaking in warm water for about 15 or 20 minutes and when it becomes malleable, it’s good. If it has a white hue, that means you’ve let it soak for too long. Let it harden, then re-soak it. In order to fasten the gutwall properly, I’ll use 2 small strips of leather with a half inch slit in each. The strips have been looped inside themselves in order to create a hole for the gutwall. String the leathers through the bottom two holes of your shaft. Tie the leathers in order to lock them off. When beginning to string the gutwall, only use enough to lace it up through the top hole and back down through your front-facing leather. Lace through the top hole, downward. Leave the left-to-right portion alone for now. 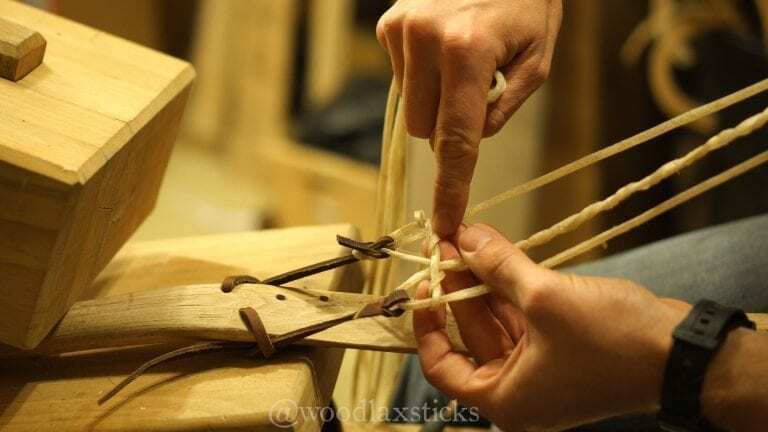 Then, tie an overhand knot in order to lock it in place, and twist the string around the pre-existing lace back downward. Remember to adjust as you go, because you want it to twist, but not coil. When back down at the bottom, lock the string off once more. Remember not to stress too much about how it locks off, since the material will become very stiff again. 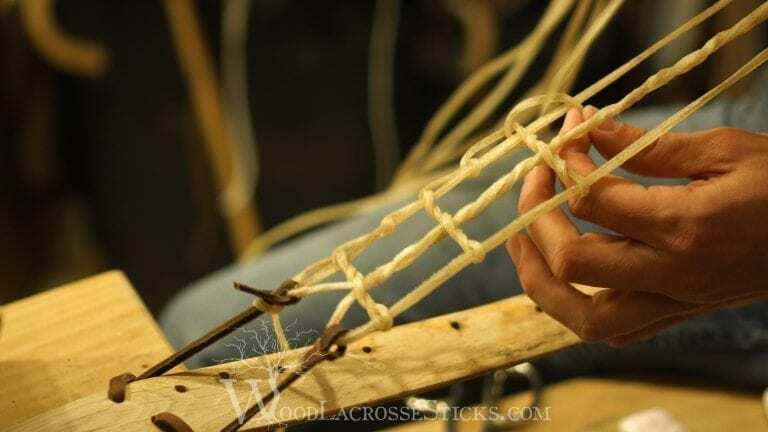 Now, take the longer lace and string it through the left-to-right hole at the top of the stick, to create one of the walls of the structure. Once strung through, pull the lace down to create the second wall, and, once again, lock the lace off. 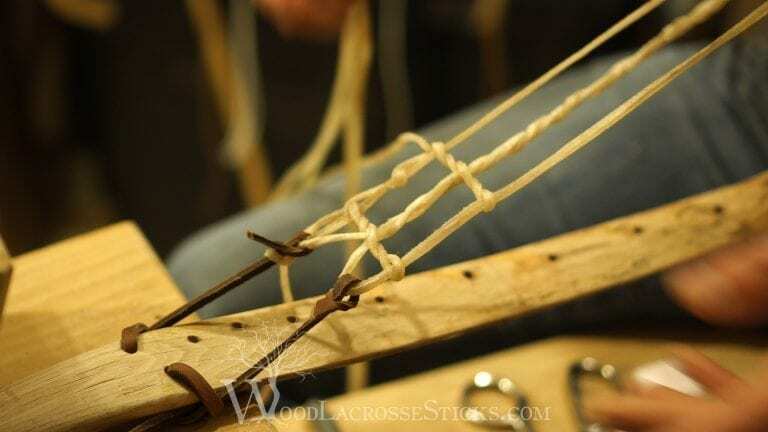 Now that all 3 columns of the design are in place, you’ll need to place an object (preferably one that doesn’t absorb water) at the top of the shaft in order to keep the 3 columns parallel while you continue to string the sides. The row pattern is very intricate. Please refer to the video when beginning your rows to ensure that the pattern and shape are properly done. There should be about an inch to an inch and a half between each row you make, and you’ll need an empty lock-off point, just for structure. Once you’re at the top, do your best to make one more row, so the gutwall keeps its shape. Try to fasten the row over the top knot from before. You’ll need to find a hole to string the gutwall through in order to get to the open side, so you can begin twisting the gutwall back down. Once you get to the bottom, it’s time to lock it off. If you make 3 overhand knots, that should be sufficient. Remember, if you think there’s too much slack in the gutwall, you can readjust your leather straps to tighten it. Another tip is to put an object between the top columns in order to keep the pattern symmetrical. After about 24 hours of sitting, the gutwall should be stiff enough to string on. Now Go String a Gutwall! I wanted to share this technique with you guys, not only because it looks great, but because I have yet to find a wood stick that this particular pattern didn’t work on. 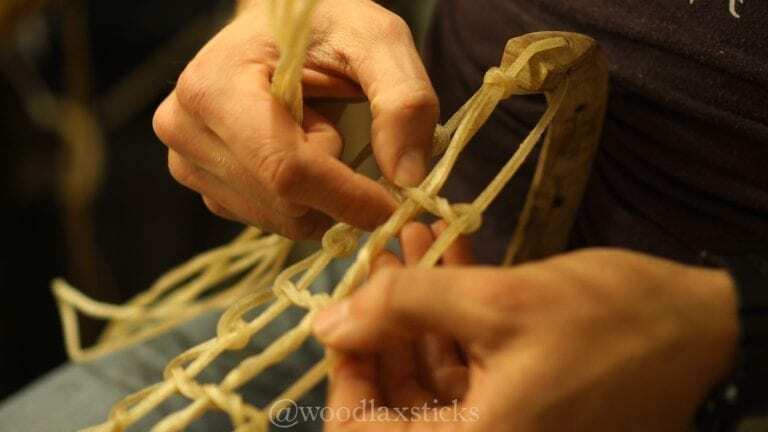 Make sure you follow @woodlaxsticks on Instagram, and head over to woodlacrossesticks.com for all your traditional stringing needs (including gutwall kits), and remember to leave your comments below.